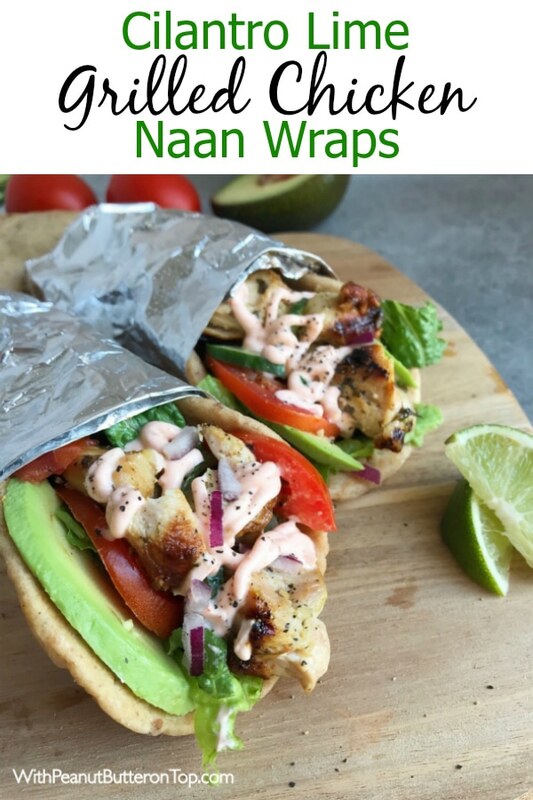 These Cilantro Lime Grilled Chicken Naan Wraps hit it out of the ballpark when it comes to flavor. Not only are they super simple to make, but the flavors will make your taste buds dance! And they are just under 400 calories per loaded wrap! 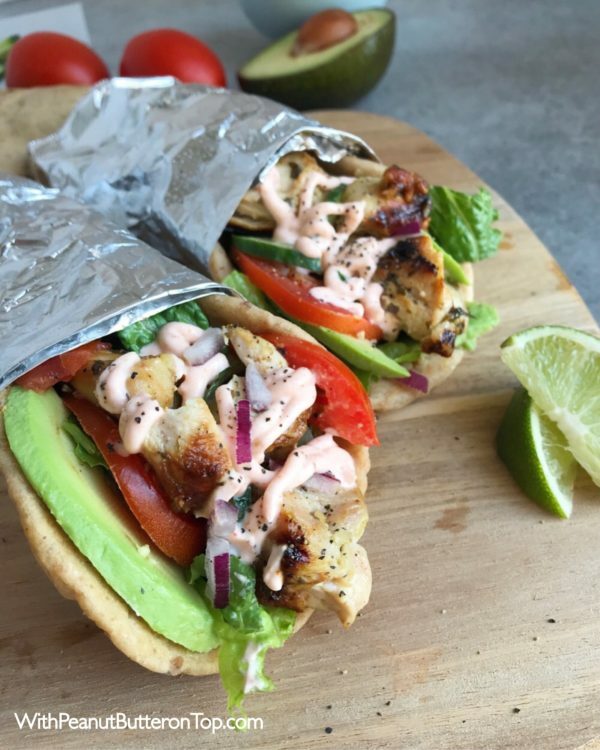 This is the perfect meal for meal prep, lunches, or you can add the chicken to your favorite salad for a burst of delicious flavor! Let’s take a moment to sit and salivate over these, shall we? I’ll try not to be offended if you’re not. I enjoyed them enough to salivate for the both of us. HA! But I can guarantee that when the chicken is cooking, the smell that will fill your kitchen is simply incredible! I wish there was a way for me to virtually share smells through the screen. I know that may sound silly, but once the chicken hits your pan – you will think of me. And you will agree. The chicken can be cooked indoors or out on your outdoor grill/BBQ. It’s completely optional to cube them and add them to skewers. You won’t sacrifice any flavor doing so. You can leave them as whole breasts and grill them that way. Just be sure to not only wet your skewers down prior to adding the cubed chicken (this prevents a grill fire/burning on an outdoor grill/BBQ), but to also brush a bit of olive oil over your outdoor grill or indoor grill pan prior to heating to prevent any potential sticking. If you’re looking for the perfect indoor grill pan, I do highly recommend a pre-seasoned cast iron grill pan. In my honest opinion, it helps to give that crispy taste to the outside of chicken, yet keep the moisture and flavor packed inside. I use this Cast Iron Square Grill Pan! It works like a charm and best of all — it’s affordable for any budget! Complete win/win in my book! Being the carbivore (yes, you read that correctly) that I am, I could eat naan wraps every day. In fact, following this shoot – I inhaled one quicker than I care to admit. Thankfully, no one was around to see it happen. The flavors from the cilantro lime marinade on the chicken to the heat from the Sriracha Yogurt Sauce are downright scrumptious. And to me, they compliment each other quite well. PLEASE NOTE: If you’re not a fan of some heat when you eat, you’re more than welcome to omit the yogurt sauce and substitute it for your own favorite sauce or dressing. I do recommend hummus or tzatziki sauce! If you are salivating at this point, do yourself a favor and sign up for my newsletter! Free emails sent directly to you – no spam, EVER! Just delicious recipes! 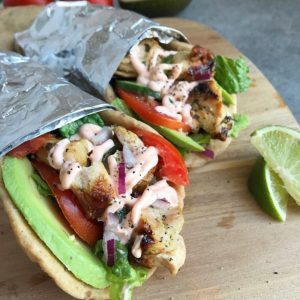 This recipe is as easy as marinating the chicken for a minimum of 1 hour, tossing it into a grill-pan (or directly onto your grill, whichever you prefer) and then tossing it together with the lettuce, tomato, avocado, and the creamiest, most delicious (yes?) sriracha sauce you’ve ever had. So easy and delicious you’ll be making it regularly! This recipe will make 4 servings to fill the toaster size naan bread. If you cannot find the toaster size, simply double the recipe to fill the larger naan bread. I marinated the chicken for a minimum of an hour, but as we all know – the longer you marinate something, the better it will taste! Patience is a strong virtue when you’re hungry and eager, I know! The Sriracha Yogurt Sauce does have a bit of heat to it, so if you’re worried – simply add the Sriracha as the last ingredient to the sauce, adding teaspoon by teaspoon until it reaches your heat preference. This recipe is perfect to MAKE AHEAD OF TIME for those busy days we all know and love so well. I suggest making this chicken with the marinade in bulk to have on hand for such occasions. Simply toss the marinade in with the chicken into a ziplock bag and freeze immediately. On those days that you know you’re going to be too busy for prep – pull the bag out of the freezer in the morning and pop it into the fridge to defrost and marinate through the day. I highly suggest squeezing fresh lime juice over the tip of your assembled wrap for additional flavor. 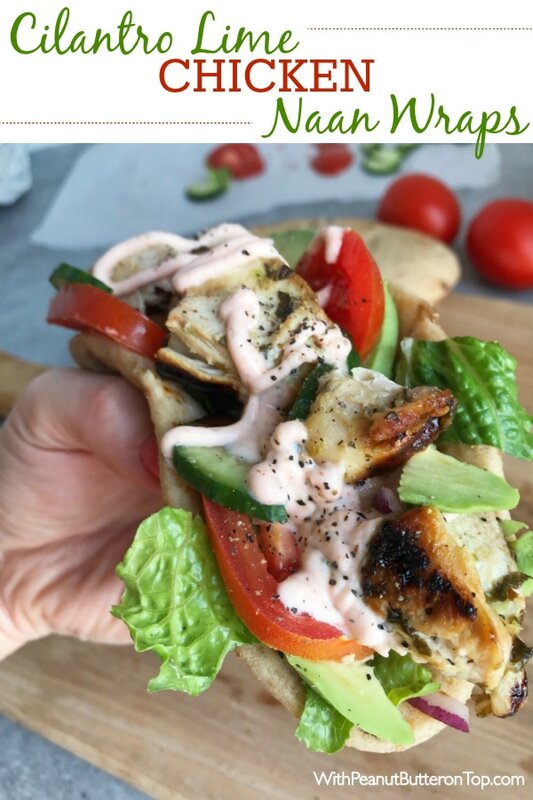 This chicken naan wrap is incredibly delicious. The marinade is exceptionally easy and quick to prepare and will simply knock your socks off! This is the perfect meal for any lifestyle or any time of the year. Works splendidly prepared for a lunch or dinner. Combine the ingredients for the marinade directly into a ziplock bag or bowl. Add the chicken breast to the bag/bowl and seal tightly, removing any excess air. I recommend using a ziplock bag as I find this makes it easier to mix and massage the ingredients over the chicken - helping with even dispersement. Allow to marinate overnight or a minimum of 1 hour. In a small bowl, mix together ingredients for the yogurt sauce. Cover and refrigerate until needed. When you pull the sauce out of the refrigerator to use, be sure to stir thoroughly, as the liquid from the yogurt will begin to separate. This is natural for yogurt to do. Depending on how you're looking to cook the chicken, you can either cube them and place them onto skewers or leave as is in full breast form. If you're using skewers, cut the chicken into cubes now and place them onto the skewers. If you're using an outdoor grill, be sure to wet the skewers prior to using them to prevent them from burning or catching fire while on the grill. Heat your grill or BBQ (I used this Cast Iron Grill Pan on my stove) to medium heat. If using an indoor grill, be sure to add approximately 1 tablespoon of extra virgin olive oil to your grill pan prior to heating, brushing it over to evenly distribute. Once the pan/grill has heated, add the chicken, allowing to cook on one side for 4-5 minutes until it reaches a nice charred look. Turn the chicken and allow to cook 3-4 minutes. Time will be dependent on how thickly cut your chicken is, so please keep that in mind to prevent overcooking/burning. While your chicken is cooking, prepare the additional ingredients - avocado, tomatoes, romaine, etc. Remove the chicken from the grill, cover with aluminum foil to keep warm and set aside. Remove chicken from skewers or slice chicken into desired thickness. The thinner the better for wraps. 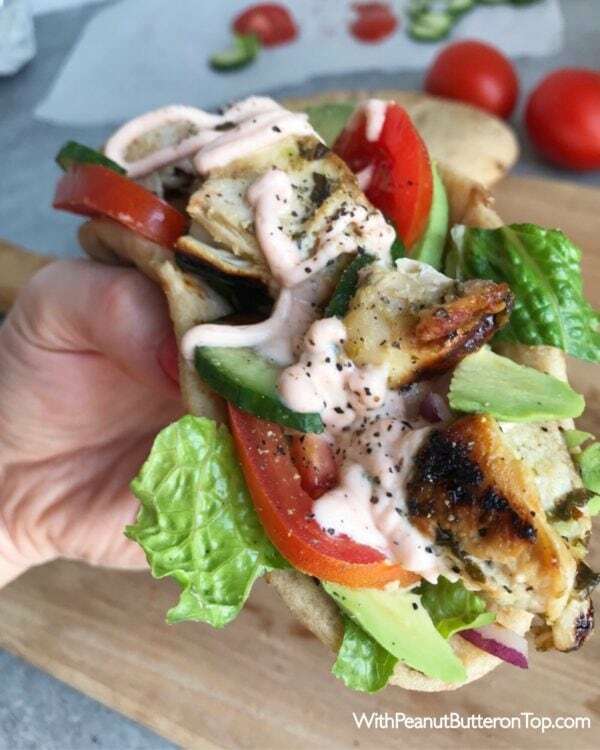 To assemble the wrap, lay your warmed flatbread onto your plate - add sliced avocado, romaine, tomatoes, cucumber, onion and chicken. Top with the Sriracha Yogurt Sauce (or sauce of choice) and a dash of black pepper. Serve immediately. *I used Fage plain, non-fat greek yogurt. *Exercise caution when adding sriracha! If you don't like a lot of heat, start with 1 teaspoon at a time when adding it to the yogurt. You can also sub for RedHot. *I used Stonefire Ancient Grain, toaster size. If you cannot find toaster size, double the recipe and used 4 regular-sized naan bread. *If you grill the chicken on the skewers, I would advise wetting the skewers prior to putting the chicken on, as this will help prevent the skewers from burning or catching fire. Not necessary if using an indoor grill pan. This will come in handy, not just because it is better served warm, but also because it helps to make the bread pliable. This helps with adding the ingredients and then rolling to wrap without any tears. 1. Sprinkle very lightly with water or brush a small amount of oil or butter over the top. - Conventional Oven: Preheat oven to 400 degrees F (200 degrees C). Place onto a baking sheet. Allow to bake for 2-3 minutes. - Grill/BBQ: Heat grill to 350 degrees F (180 degrees C) and allow to cook 1-2 minutes. - Microwave: 15-30 seconds per naan, wrapping top and bottom in a paper towel. Hey Esther! Sorry for the inconvenience. I switched plugins for my recipes and the nutrition did not transfer over as the ingredients/directions did. So I need to either manually do every single recipe one by one or find a way around it. Either way, they will be making their way back onto each recipe! Yesss thank you so much! I see it today! Hurray!! I love your idea for the garlic naan! I love those! I know that not everyone is a garlic lover, so I opted for the plain for this recipe. I’m so happy to see that you and your husband enjoyed it so much! Thank you!! This was fantastic! I’m on a food plan but no one else is inside my household so find this recipEcwas a awesome! I was able to switch out the naan bread for me and I even had some for lunch today. Score!! 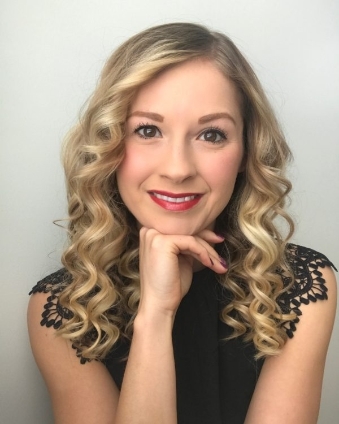 Hey Heather! Thank you so much! I’m so glad you and your family enjoyed it so much – especially with your food plan! Is your nutrition breakdown for the wraps and the yogurt sauce? Or is it for the wraps alone? I’m a wimp when it comes to spicy stuff, so I won’t be making the sauce. Hey Aubree! The recipe is for both! The yogurt sauces nutrition would be minimal. But you can use an app, such as MyFitnessPal, to calculate the nutrition on just the wrap with the ingredients that you would use!